Maintaining the household is difficult. While you think that you have done enough to keep everything up to the mark, but, on the day of cleaning, you realize that you were deluded. We rummage through every area of the house and find most of the items running out of their charm—this is especially true for carpets. Carpets add to the homeliness of a house. They come in all sizes and designs, but each one them requires special attention from the owner. 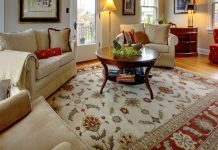 Generally, carpets last, on an average, for about seven years, but during those years, your carpet may already be losing its freshness and withering in appeal. However, there are a few but really simple ways to ensure your carpet is best-maintained and it does not lose out to perilous external factors. In this article, we will talk about 5 really simple ways that make your carpet last longer. All it is needed from you is a little bit of your time and focus. With this note, let us take a look at these steps we just talked about. Dirt is the biggest and most persistent foe of carpets. Once they get their hold on carpets, you will not be able to get rid of them that easily. It is, thus, really important you make sure that dirt remains where it should be—outside. In many countries, it is conventional to remove shoes while entering a house. This convention has become a habit among the citizens of those countries, and it really contributes to reducing the inflow of dirt inside the house. Well, if you want to not remove your shoes, then there are alternatives of course. You can place foot mats just outside the entrance to the main room so that minimum dirt get its way inside the house. Studies show that when cleaning shoes on a foot mat, about 17 steps are required for getting rid of the dirt from the soles of your shoes. When dirt gets on the carpet, it settles down and wears out the fibres. It also dampens the overall texture and color of the carpet, weakening its foundation. With a couple of harsh steps, your carpet will look like a piece of rag—you would not want that to happen, would you? You have to maintain that new look on your carpet—you must vacuum. Having a top-class vacuum cleaner is not sufficient if you do not invest the top-class time of yours in using it. Get it out of your closet and put it to some good use. The first thing is to make sure your cleaner is working fine. Take note of a few things: the bag of the cleaner should not be more than half full; the belt turning the brushes is tight enough; and yes, the brushes are not worn out. The second thing you should know is that vacuuming the big crumbs easily noticeable to the naked eye is not enough. That is why you should vacuum the carpet at least two times a week. With regular cleaning of Carpet, you will be able to eliminate those microscopic dust particles that are major contributors to the weakening of fibres. When you buy carpets, you will often come across “Stain Warranties”. However, the thing is that you will have to do the cleaning up of stains and spills all by yourself. If you let a spot stay on the carpet for an inordinate period of time, then it can become a permanent stain. Some warranties provide you with a spot removal guide or chart. These guides include a list of many substances and provide particular instructions on how to remove the spots from carpets. In case you are not provided such chart, you can download them online. Take note that carpets are really sensitive, and therefore, you must blot before removing a spill. Do not scrub or rub against the fabric. It is recommended that you apply a little spotting solution and then gently blot. You might end up repeating the process a couple of times but do it. Do not wet the carpet too much. Carpets wear out if they are confined to one place for a long time. Similarly, if your furniture has been placed on the carpet for a long time, then their feet will wear out the carpet at places where they stand. In case the layout of your room is such that moving the furniture is feasible, we strongly recommend you do the same. It is better that you diligently undertake this exercise every six months. This way you will be able to prevent premature deterioration of your carpet and extend its life considerably. Quite honestly, if you are unsure whether you will be able to do properly the cleaning job, then do not do it. It is okay if you seek assistance from a professional. It might cost you a few bucks, but your carpet will be saved.